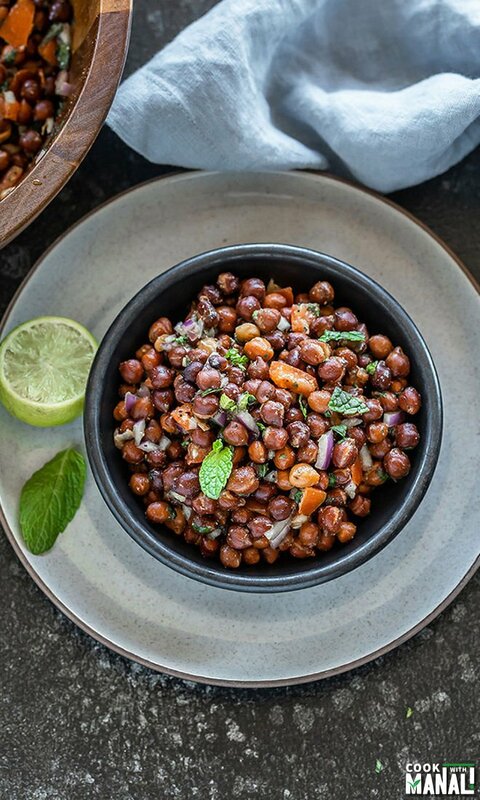 In India, we used to eat kala chana (kala=black) quite often. Mom cooked it with potatoes and make a curry out of it like this kala chana curry. Also the dry version with spices was always made as prasad (offering to god) for Navratri. I don’t cook it much either, not as much as I should. I was thinking the other day that I grew up eating so many lentils, pulses and legumes and now I just cook a handful of those on a regular basis. That really needs to change. And so the other day, I made this refreshing Kala Chana Chaat. It’s super easy to make and I boiled the chickpeas in my Instant Pot to speed up the process. I like to soak all my legumes just like I saw my mom do it every time. You may or may not soak the kala chana here. I soaked overnight but a minimum of 4 hours is what I recommend. Of course, you can not soak it and cook it straight away. I like all my legumes & beans a little on the softer side so I always soak them. 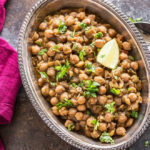 For this kala chana chaat, I boiled the black chickpeas in my instant pot. I soaked them overnight and then cooked for 25 minutes on high pressure. They were perfectly softened for my liking. If you do not soak them or soak only for couple of hours, I recommend cooking for 40 minutes on high pressure. 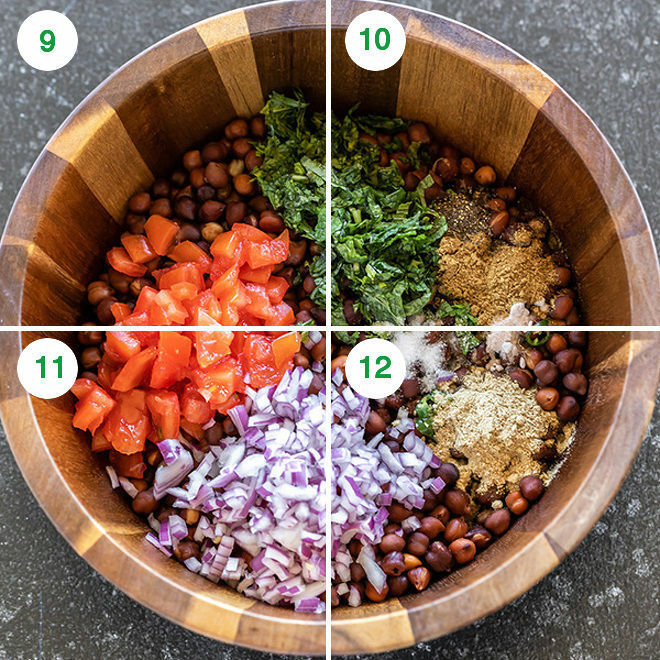 Once the chickpeas are boiled, it’s only a matter of putting everything together in a large bowl. Here’s all that I added to my chaat – onion, tomatoes, chilies, cilantro, mint and lot of spices! I removed the pulp from the tomatoes before chopping and adding to the chaat. That’s totally optional and you may use the tomato as is. 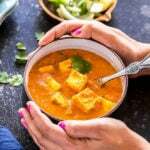 You can also add several things to this chaat like boiled sweet potatoes or avocados. People also add ram mango to it to make it more tangy. Some pomegranate arils would be nice too! By the way, chaat is generic term used in India for roadside food that is spicy and tangy. You can call this a salad too but since it has chaat masala and chilies, we call it kala chana chaat. 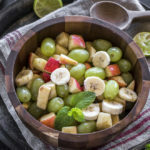 This chaat makes such a great lunch or even snack! I ended up eating it with my evening chai. I also packed it for Sarvesh’s lunch and he loved it! 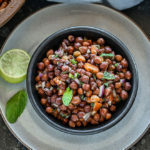 This Kala Chana Chaat tastes best when chilled for few hours. That gives time for the flavors to mix in together. So, I recommend refrigerating it for couple of hours at least before serving. 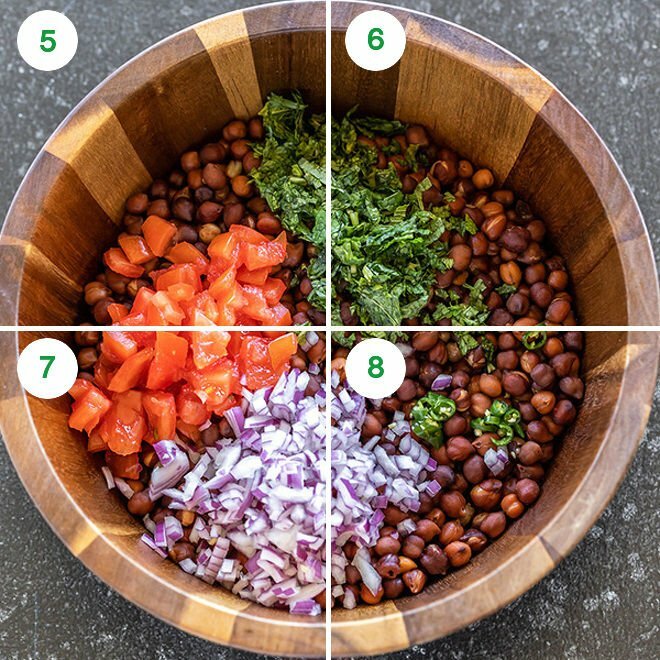 Here’s how you make this healthy and yummy Kala Chana Chaat! 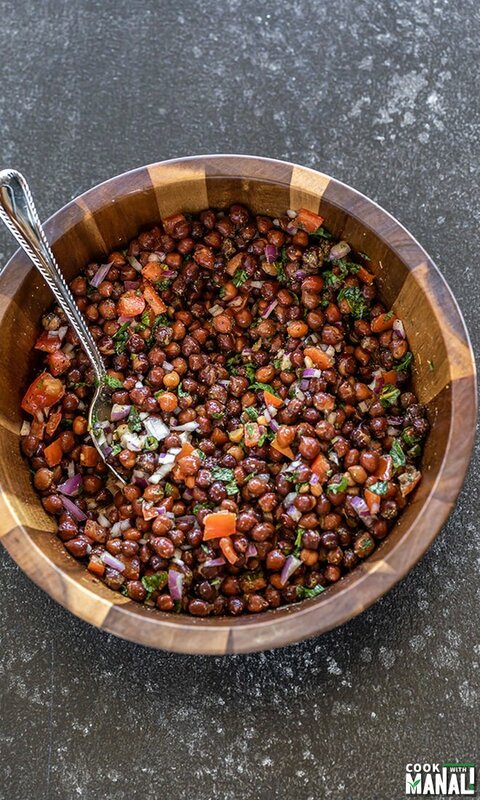 Soak the kala chana (black chickpeas) overnight or for a minimum of 4 hours in 3 cups water. Drain the water, rinse the chickpeas and boil them until done. 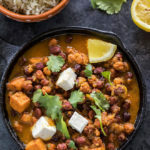 If using Instant Pot- 25 minutes at high pressure with natural pressure release if soaked overnight (use 2 cups water for 1 cup soaked chickpeas). If soaked for 4 hours, 40 minutes at high pressure with natural pressure release. This is what I did. If using stove top pressure cooker- 7-8 whistles on high heat. Let the pressure release naturally. Once the kala chana are boiled, drain the water and then place them in a large bowl. To the bowl now add chopped tomato, onion and cilantro, mint. I remove the pulp from tomatoes before chopping but that’s optional. Then add the spices- chaat masala, kala namak, cumin powder (optional), amchur, red chili powder and salt. 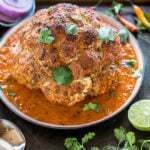 Toss to combine everything together and then squeeze in fresh lemon or lime juice. 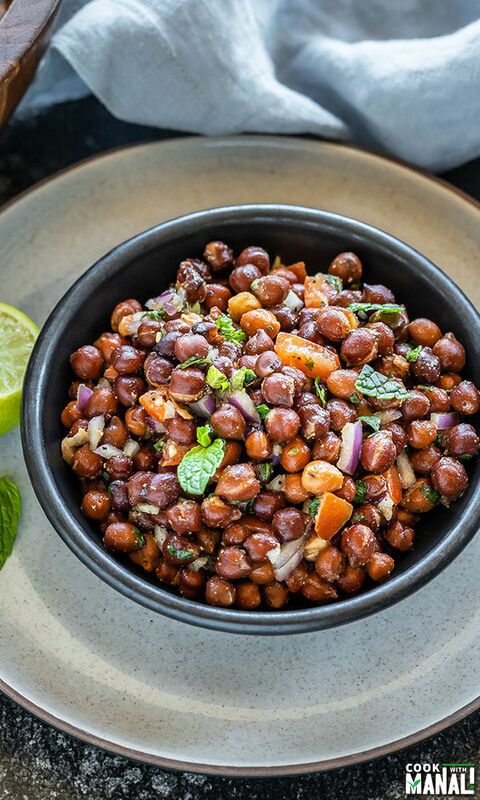 Enjoy this healthy kala chana chaat for snack or lunch! 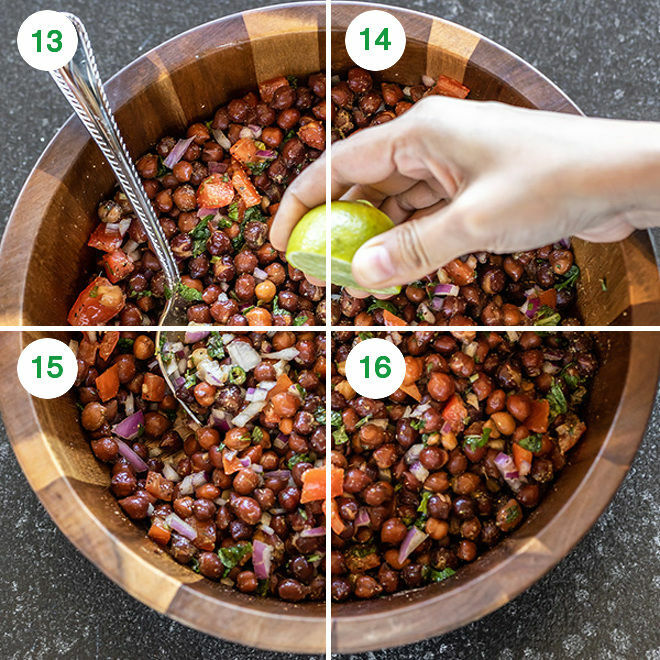 If you’ve tried this Kala Chana Chaat Recipe then don’t forget to rate the recipe! You can also follow me on Facebook and Instagram to see what’s latest in my kitchen! 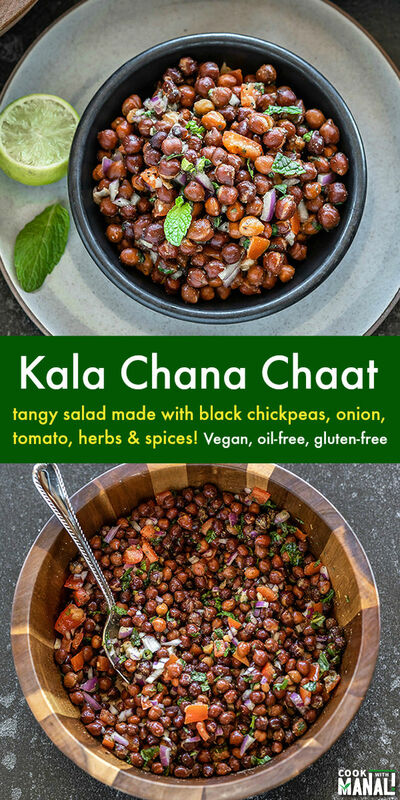 Healthy and vegan Kala Chana Chaat is made with black chickpeas, onion, tomato, fresh herbs and some tangy spices! 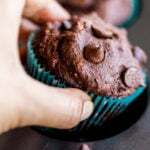 Oil-free and gluten-free too! If using Instant Pot- 25 minutes at high pressure (use 2 cups water for 1 cup soaked chickpeas) with natural pressure release if soaked overnight. If soaked for 4 hours, 40 minutes at high pressure with natural pressure release. This is what I did. To the bowl now add chopped tomato, onion and cilantro, mint. I remove the pulp from tomatoes before chopping but that's optional. 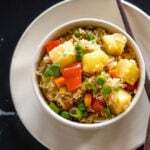 You may add other things to this chaat like boiled potatoes, boiled sweet potatoes, avocados, raw mango, pomegranate arils. Adjust spice level to taste. Once you have mixed everything together, do a taste test and adjust spice levels to taste. 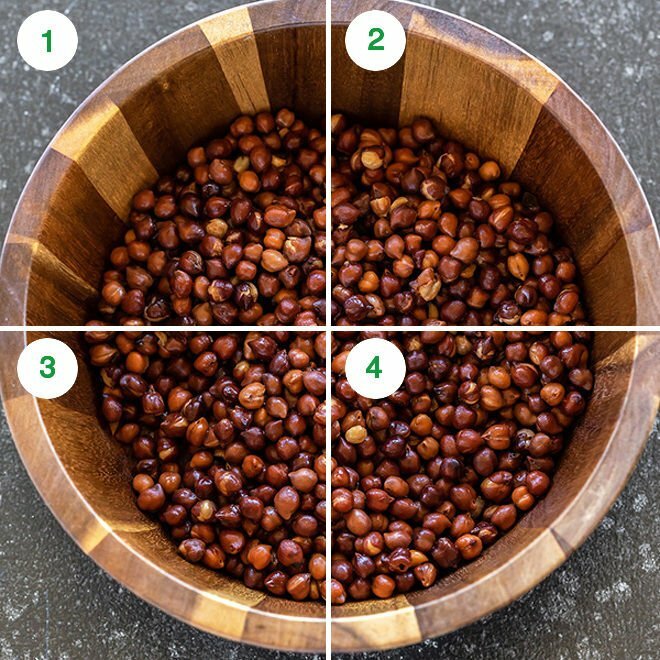 If you do not soak the black chickpeas or soak only for couple of hours, I recommend cooking for 40 minutes on high pressure in your Instant Pot with natural pressure release. 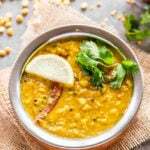 How much water do you add to the kala chana when cooking them in the IP or pressure cooker?